This chapter examines the use of provisional measures by the ICJ to protect interests beyond those of states alone. The ICJ has shown sensitivity toward the plight of individuals through its use of provisional measures ordered pending judicial proceedings. 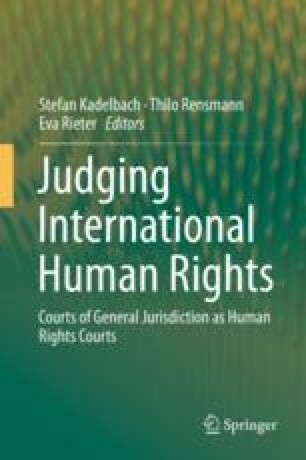 The chapter posits that a clarification of this practice is one step toward answering the question whether the ICJ could contribute to the development of human rights law, especially since it is a court of general jurisdiction as opposed to a human rights court. It discusses types of situations in which the ICJ has used provisional measures in the general interest, for example, by often referring to the non-aggravation of the conflict. The chapter examines recent and older examples of the use of provisional measures, moving away somewhat from the traditional principle of consent. It shows how the ICJ has at times been less strict in the application of four traditional aspects of provisional measures when faced with situations involving human beings at risk. The chapter also discusses the ICJ’s confirmation of the binding nature of its provisional measures in the LaGrand judgment (2001). This has had a significant impact on human rights adjudication, at least within Europe. At the same time, its determination that its provisional measures are legally binding has also been argued to require a more cautious approach toward the use of provisional measures, clinging more closely to the traditional principle of consent. The chapter discusses a development involving the requirement to show a ‘plausible case’ already at the stage of provisional measures. This indeed indicates a more limited approach by the Court to ordering provisional measures, also when human rights are involved. The chapter concludes by exploring the question how the ICJ deals with states that ignore its provisional measures.